Although East Africa is still a largely retentionist region, Kenya, Tanzania and Uganda have not carried out executions since 1987, 1994 and 2003 respectively. However, all three countries continue to hand down death sentences, and none have established an official moratorium on executions. The three countries are in a state of flux and have made significant changes in law and policy in recent years to restrict the application of the death penalty in practice; however the risk that the death penalty could be resumed remains. Kenya retains the death penalty for five offences. It has the highest number of people on death row in East Africa, an estimated 1,179 prisoners in 2013. 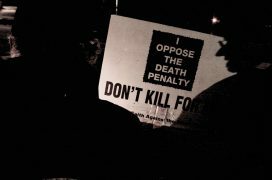 Steps have been taken by progressive parliamentarians to abolish the death penalty; however, the most recent motion was defeated by Parliament in August 2007. In August 2009, President Mwai Kibaki issued the largest known mass commutation: 4,000 death row prisoners had their sentences commuted to life imprisonment. The Appeal Court case of Mutiso abolished the mandatory death penalty for murder in 2010, but subsequent cases have overturned this. Following the case of Susan Kigula in 2011, which found that the mandatory death penalty was unconstitutional and that more than three years on death row constituted cruel and inhuman treatment, prisoners on death row in Uganda are having their sentences reassessed. Numbers on death row are in decline as a result, falling from 420 in June 2013 to 208 in March 2016. However, Uganda retains the most death penalty applicable crimes within the region: 28 crimes in total (11 civilian crimes and 17 military crimes). This includes crimes such as robbery, smuggling, acts of treason and terrorism, and non-lethal military offences. Tanzania has not carried out executions since 1994, but its courts continue to hand down the death penalty for capital offences, including for murder, treason, and misconduct of military commanders under the National Defence Act. In 2008, a court petition filed by three local civil society organisations challenged the constitutionality of the death penalty remained pending in the High Court. The constitutional review process currently underway is considering whether to abolish the death penalty. In 2015, 472 people remained on death row. Neither Kenya, Tanzania nor Uganda have ratified the Second Optional Protocol to the International Covenant on Civil and Political Rights. At the same time, the number of people sentenced to life imprisonment is increasing. Kenya has 4,637 life-sentenced prisoners (including 58 women), and Uganda has 329 (including 124 women). The number of offences that carry life sentences is high in the region. Kenya has 26 offences for which a life sentence may be imposed, and Uganda has 38. These include crimes such as forgery, counterfeiting, robbery, rioting, cattle rustling, and non-violent military offences. This work was delivered through our EU-funded Death Penalty Project and implemented in partnership with the Foundation for Human Rights Initiative (FHRI). Read an independent evaluation of this project conducted in 2015.